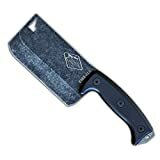 Quick – What’s the first name that springs to mind when someone mentions “budget blades?” For me, the response is usually “Morakniv.” But there’s another answer out there in this Pictionary of the mind – Condor. Though generally known for the Bushlore knives, this El Salvador-based manufacturer offers a wide line of outdoor blades, most of which clock in around $50. This puts them well above the plastic and partial-tanged Mora Companions, but in the same neighborhood as the Kansbol and Bushcraft Black. 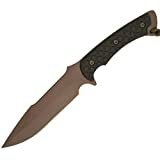 Add in their full tang construction and leather sheaths, and the Condors become quite the value proposition. But that’s just the bird’s eye view. I recently got up close and personal with the Condor Swamp Romper, a scandi-ground model operating in the $50-$60 realm. Here’s how it held up in the kitchen and on the trail. When dealing with budget knives, my first question is always the same – “What’s the steel?” In the case of the Condor, we’re looking at 4.5-inches of 1075, which is a lower-carbon version of the 1095 found on ESEEs and other popular outdoor knives. It’s easier to sharpen (which is saying something, if you’ve ever breezed through a touch-up session with 1095) and less prone to chip. On the downside, it’s also more rust prone and doesn’t have the same edge retention. Speaking of edges, the Swamp Romper’s scandi grind runs the length of its drop point, satin blade. Width across the squared-off shoulders is 0.12-inches, a nice medium-size for both splitting and slicing. The overall length and weight come to 9.5-inches and 5.34-ounces, respectively. It’s a fairly lightweight tool, considering its full tang and the scope of its cutting edge. There’s even a sharpening choil at the back end, a welcome addition for do-it-yourselfers like me. Let’s talk about performance. Though it may hail from the Swamp, I found this knife to be a Romper in the kitchen, as well. Tomatoes, onions, carrots – It handled foodstuffs with ease. The tallness of its scandi grind and the thinness of its blade made it a surprisingly excellent culinary tool – Better than most of the Moras I’ve used. Field testing was a different affair. There aren’t a whole lot of wetlands where I live in New Mexico, but an hour’s drive north to Colorado yielded a snowy canyon trail and frozen river banks. After finding a dry spot, I gathered some small timber to make a fire. The Swamp Romper proved to be an admirable cutting companion, feather-sticking and batoning with no issues to speak of. The rough spine is capable of striking a fire steel, though perhaps not quite as well as I’d expected. Now, the downside. I knew the 1075 would be rust-prone, but I wasn’t prepared for just how rust prone it was. It discolored almost immediately, showing marked stains by the time I returned home. Now, this isn’t something I necessarily mind in a field-use tool. Patina tells a story, and I like it so long as there’s no structural weakness behind the pretty picture. But I am a little concerned, given that I don’t think the blade actually touched any snow during testing. Whatever moisture that came into contact with the blade was probably from some slightly damp wood. A quick cleaning, stopping, and application of mineral oil brought it mostly back, but it did take some of the bloom off this particular rose. Here’s where things get muddy. The Swamp Romper’s ergonomics are solid overall. Its 5-inch long and 0.85-inch thick handle resembles the broomstick-style found on some of my favorite outdoor knives, and the knife fits my medium/large hands very well. The scales themselves are made of contoured walnut. And what are walnuts famous for? That’s right – They crack. Somewhere along the line (I think when I was gently chopping at a dead branch), a piece of the handle sheered completely off. You can see the glue marks where it broke free, leaving me without a finger guard on one side of the knife. For me, this was the turning point of the review. Up until this failure, I’d been generally pleased with the rugged, tool-first aesthetic the Condor was projecting. But when I say I was gently chopping, I mean it. Is the knife still usable? Sure, but who wants to carry a broken tool? It was a disappointment, akin to flushing a $50 bill down the toilet. You know what makes things worse? I really like the sheath. One of the main things that brought the Swamp Romper to my attention was the firesteel loop on its leather carrier – Something you don’t get on the more popular Bushlore. It’s not the best-finished leather I’ve ever owned (Steel Will’s Druid series beats it pretty handily), but it had that same rugged quality that I found in the knife itself. Retention was good, if a little tight at first. There was also a strange swipe of what looked like fresh paint on one side. Again, nothing I was concerned about at this price point. But once the handle broke, the knife began to move a bit more freely when stowed. What would you expect, right? Half of the widest point is now missing. The worst part about this, however, is that this altered ride geometry brings the blade into contact with the interior leather. Each time I draw it, the edge is now covered in tiny brown fragments. Not good. In the beginning, I was fairly pleased with this knife. It performed well in the kitchen and around the campfire, leaving me with positive vibes. But then it broke. Next, it rusted. And then, thanks to its newly misshapen nature, it started to eat its own sheath. So, is it worth $50? Man, I just don’t see it. It’s a roughly finished knife comprised of materials I’d call slightly below average. The nicest thing about the whole package is the firesteel loop. And even the sheath came with a strange stain. So, where exactly is the money going here? In the end, the Condor Swamp Romper is a knife that inspires little to no confidence. The steel rusts quickly, the handle is fragile, and its rough-around-the-edges charm turned out to be, well, just rough. It’s good in the kitchen, sure, and it’ll strike fire. But none of this justifies the price point. This is one swamp I’d steer clear of. Editor: I recommend buying the Condor Swamp Romper, or perhaps something else, at Condor Swamp Romper or BladeHQ. Please consider that purchasing anything through any of the links on this website helps support BladeReviews.com, and keeps the site going. As always, any and all support is greatly appreciated. Thank you very much. Josh Wussow is a freelance writer, reviewer, and the questionable mind behind JourneywindJunk, a blog that EveryDayCommentary calls “smashingly fun to read.” His more respectable work is published over at GearJunkie, as well as here on BladeReviews. See what he’s up to on his Instagram page, @JourneywindJunk.